First Line: On a Monday morning in September, three weeks into the job, the Tiverton policeman took a call from his sergeant: shots fired on Bitter Wash Road. Three weeks ago Constable Paul "Hirsch" Hirschhausen was demoted and transferred from the booming metropolis of Adelaide to the sleepy one-horse town of Tiverton three hours to the north. The tiny town suffers from isolation, racism, and a stagnant economy, and its size is misleading because even though its population is small, there's more crime than one police officer can handle safely. Hirsch is a disgraced cop, and his reputation preceded him to Tiverton. His fellow officers believe he informed on his mates in Adelaide and want nothing to do with him. Internal investigations believe Hirsch is crooked and are determined to convict him of something-- even if they have to plant evidence on him. This man has more than he can deal with just from everyone else on the police force. When the body of a local 16-year-old girl is found at the side of the road, the situation in Tiverton heats up, too. Is Hirsch tough enough to deal with it all? I've enjoyed other books by Garry Disher, and Australia has always been a favorite destination for my armchair travels, so I picked up Hell to Pay anticipating a good read. What I didn't foresee was how quickly Disher would hook me with his main character and how deeply I would be drawn into this story. Even before the author relates the mess in which Hirsch was embroiled in Adelaide, I was on his side. It's the way Hirsch carries out his duties as a police officer, and it is in the way he treats the people who live in Tiverton and the surrounding area. Disher knows that actions often speak much louder than words. Perhaps I also sided with Hirsch so quickly because I normally prefer the underdog. The few characters who like him seem to be ones who can't do him much good-- and I wanted Hirsch to have some good in his life. Few people would be able to withstand the sort of verbal and mental abuse that he has to deal with every single day. Yes, Disher has put a fascinating character right in the middle of a first-rate mystery, and if it didn't sound overblown I'd say it was an honor to watch Hirsch solve the young girl's murder despite everyone who's against him. The setting is perfect for the story. Hirsch is out in country with sparsely settled land spreading in all directions under a limitless sky. Turning the pages, readers can almost feel themselves squinting into the sun while wiping dust and sweat off the backs of their necks. The country Hirsch finds himself in may be big, but it's been made to feel small and claustrophobic by shattered dreams and hatred. It's land turned minefield by the secrets of the people who live there, and even though I picked out whodunnit early on, it didn't matter. Constable Paul Hirschhausen is a character I'll remember for a good long time. I recommend all of you to make his acquaintance, too. This sounds like a good one. I think another book by Disher a year ago or so was also one that was quite good and that's on my TBR list. I'll have to add this title to it. That one was Bitter Wash Road; my library doesn't have it, but it got excellent reviews. It's a stand-alone. Oops, it's the same book but retitled for sales in the U.S. No wonder it sounded so good and familiar. Maybe my library will get this title. As I was reading your comments, I thought to myself that Bitter Wash Road sounded awfully familiar. Of course it would-- that's a road Hirsch does a lot of traveling on when he's out and about taking care of the citizenry! Cathy - This one is definitely on my TBR. I first heard of it as Bitter Wash Road, too, and can't wait to read it. I wish US publishers wouldn't mess with Australian book titles. I always prefer the original titles, and it saves me from potentially buying the same book twice! 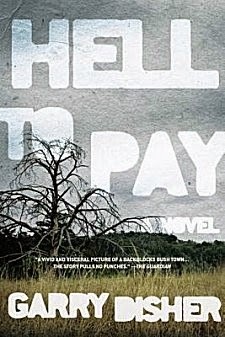 Well, Hell to Pay is a heck of a lot cheaper than Bitter Wash Road at online booksellers. I cross my fingers that my library's buyers will take note of this book. The head publicist for Soho told me that this book is proving to be a tough sell, so it sounds as if you do need to cross those fingers!